It's the Mayan calendar all over again. No matter what corner of the internet you browse, pretty much everyone has agreed that 2016 was a less than successful year. Memes about “the death of 2016” went rampant across timelines for the entire month of December and, despite the lackluster performance by Mariah Carey this New Year’s Eve, everyone welcomed 2017 with a bright smile. Now, however, outlooks are getting a bit more…serious? 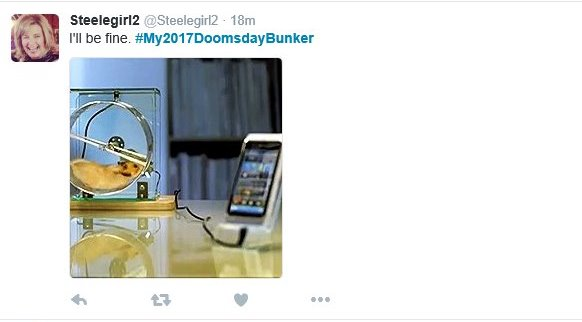 I’m unsure of whether this stemmed from the US election, the never-ending global terrorist attacks, the zika virus, or any of the other thousand disasters that happened last year, but the latest trending topic on Twitter is #My2017DoomsdayBunker, and people have some creative ideas that I’d like to share, in case any of us need some house-hunting tips or ­bunker-hunting ideas? If this guy’s tweeting in reference to the election (which is only my assumption), then he’s contradicting himself quite a bit. 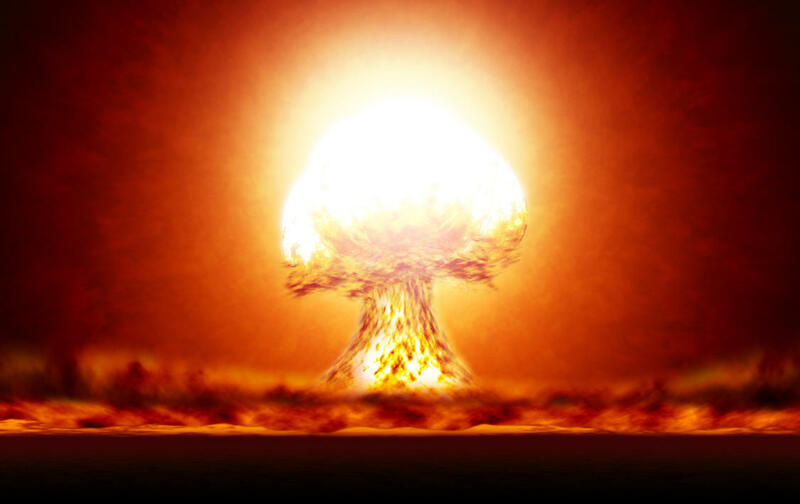 Hide from the “WWIII” that the election is thought to inevitably create, while at the same time endlessly marathoning our President’s 2000’s reality show? It’s not my business, but it doesn’t make a lot of sense, either. I think the alcohol poisoning will kill you before the doomsday can even get close. 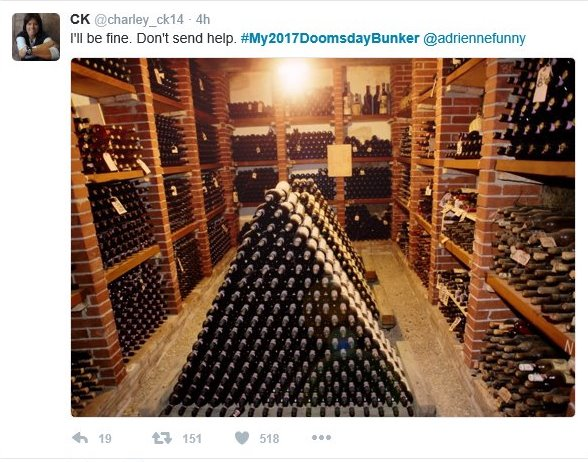 Sidenote: I wonder how much money all that wine is worth; from the super-old-looking bottles on the right shelves, I’d bet this user would have enough cash to get a stable bunker with wine to spare. I’m going to find out which Chick-fil-A she’s talking about because this girl is going to survive longer than any of us; she knows exactly where to go to ensure the best chance of making it out alive. And with those waffle fries and unlimited Ice Dream? 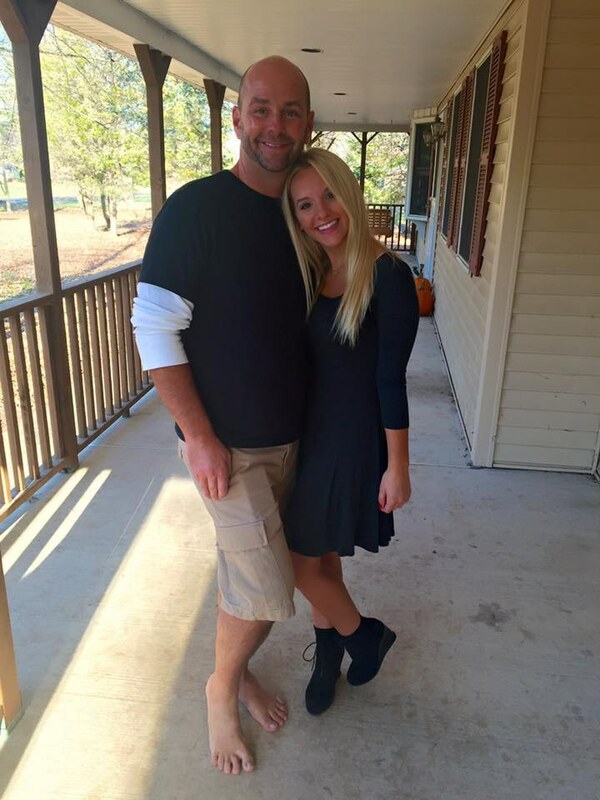 She’s going to be living, and living large. This is good in theory, and I’m sure the little rodent will appreciate some exercise, but I’m not sure what she’s planning to do with that phone when any sort of “doomsday” will immediately wipe out any phone lines and Wi-Fi connectivity. But her hamster will be healthy, I suppose. 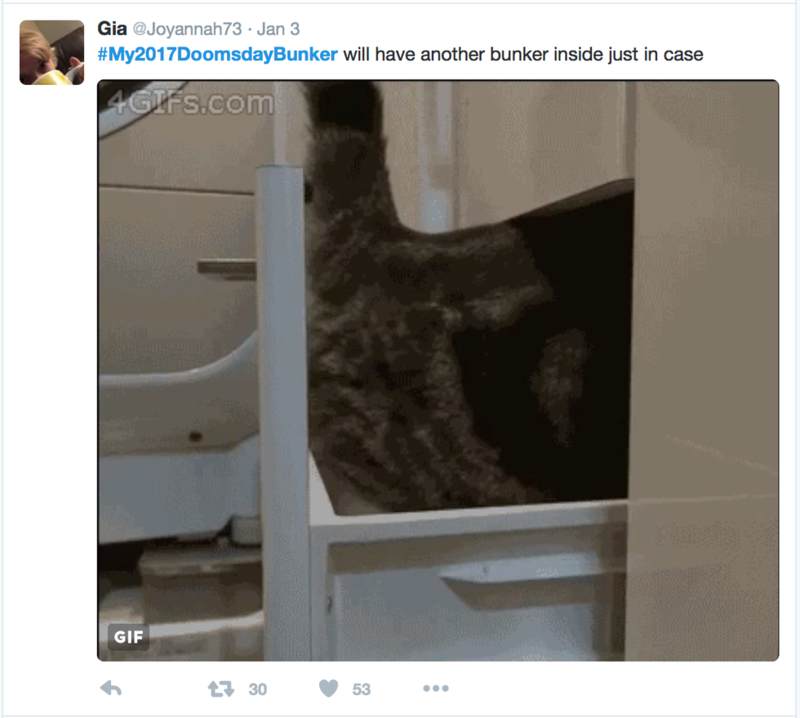 I would make a bunker in a bunker, too, but it would be just for my pets, to be honest. They’re innocent and perfect, so they deserve double protection. We created this election, we destroyed the environment, we created nuclear warfare, so just let the kittens be. To top off this list is the one person who seemed to have some sense about them; there have been like four “apocalypses” since I was born, and I’m turning twenty this year. Someone is always claiming the world’s going to end, we all get freaked out, people spend up all their money, and then nothing happens. I don’t think anyone will ever truly be able to accurately predict the end of the world, if it ever even comes, so let’s just forget the doomsday bull and go back to tweeting funny quotes and quiche recipes. We’ll all be better (not to mention more mentally stable) for it.